Next time you’re on a cellphone looking up at those long lingering plumes spreading across the sky, you might decide to end that call. If you spot any cell towers, roof-mounted transmitters or high-voltage power lines within a mile of your location, you may wish to evacuate the area immediately. And once home, you will want to permanently disconnect all wireless devices, including computer routers and “always-on” portable phone cradles. Because what you see in the sky is what you breathe. And chances are you’ve been breathing barium for more than a decade. Ever since Captain Kirk teleported to the surface of an alien planet and whipped out his portable communicator, everyone Earthside wanted one. And the telecos gave us flip-phones. Along with compulsive texting, streaming video, online gaming and banking, the worldwide web and more. It took more than 20 years to connect the first billion subscribers. But only another 40 months to connect the second billion. The three billionth “user” placed a cell phone call just 24 months after that. Never before in human history have so many embraced such risky technology so fast. In Toronto alone, there are 7,500 cell towers. In the USA: over 190,000. Everyone fixated on Captain Kirk’s hand-phaser. But his wireless communicator was the real ray gun that could not be dialled down. Cell phones and “cellular networks” are aptly named. Every transmission disrupts your cells directly. “Human beings are bioelectrical systems. Our hearts and brains are regulated by internal bioelectrical signals. Environmental exposures to artificial EMFs can interact with fundamental biological processes in the human body,” states the landmark BioInitiative metastudy. 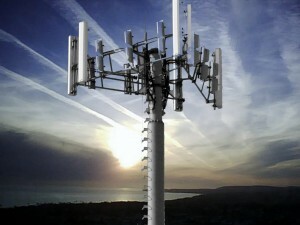 As former microwave warfare expert Barry Trower points out, an invisible ocean of electromagnetic waves from radio, radar and TV transmissions, cell towers, smart grids and overhead power cables traveling at the speed of light “can all be reflected and refracted” by metal appliances, rain, snow, glass and conductive materials deliberately sprayed into the air. A water-filled upright human is a sizeable antenna. And since all moving electrons generate electrical current, all those electromagnetic waves inundating our everyday lives pass into our bodies, where they each generate an electric current. These induced electric currents change the charge on which our complex bioelectrical body/brain/heart network operates to maintain our health and vitality. Microwaves at 1/10th British safety guidelines emit frequencies causing the biggest changes in cell calcium levels… as reported in the UK Daily Mail. At one-ten-thousanth of a watt, the blood-brain barrier opens, allowing blood proteins inside to disrupt brain signals and start killing brain cells. A cell phone typically transmits at 2 watts. Just two minutes on a cell phone, or sitting near a wireless computer router or portable phone cradle, shorts-circuits the electrical ion activity powering the blood-brain barrier. This allows proteins and other blood toxins to enter the brain andresume damaging neurons in thinking and memory centers. Dr. Leif Salford is finding “astonishing number of dead neuron cells, actually suffering holes in their brains from the damage” caused by a single cell phone call. No wonder wireless-altered brains lead to lack of concentration, memory loss, aggressive behavior, accelerated aging, impaired learning ability and dementia. Fibrils of proteins clumping in electromagnetically-altered brains are an identifying characteristic of Alzheimer’s, Early Onset Alzheimer’s, Parkinson’s, Fibromyalgia, Multiple Sclerosis and cancer patients. “There is strong evidence that… microwaves are associated with accelerated aging (enhanced cell death and cancer) and moods, depression, suicide, anger, rage and violence, primarily through alteration of cellular calcium ions and the melatonin/serotonin balance,” writes veteran EMF researcher Dr. Neil Cherry in New Zealand. While hundreds of millions of wireless addicts insist that nothing negative is happening, the effects of this invisible plague are worsening. In the United States, one in six children currently suffers neurological disability. With the much heralded new 4G LTE networks and devices “producing a waveform that maximizes radiation absorption for 3-6 year olds,” writes Simon Best, the accelerating trend is straight up. The electrosmog blanketing cities worldwide would resemble the murky view from Shanghai’s high-rise windows if it were visible. Just add micro-particulate fallout from undisclosed aerosol spray programs and one in three people can expect to be diagnosed with asthma. Low frequencies are directly linked with epidemic rates of dementia that threaten to bankrupt Canada, the USA and much of the world within a few decades – just as the challenges and costs of crop-killing climate-shifts, sea-level rises and increasingly costly oil will require all the smarts and cash we can muster. “The scope of the looming medical-care disaster is beyond comparison with anything that has been faced during the entire history of humanity,” declares dementia expert Dr. Barry Greenberg in Toronto. “The medical-care system is going to be bankrupt by 2050 if we don’t figure out a way to delay or treat Alzheimer’s disease,” echoes U.S. health and human services secretary, Kathleen Sebelius. Brain cell membranes made leaky by electromagnetic radiation exposure create enough energy to excite neurons into hair-trigger mode, overloading hyperactive brains. More than 1 in 10 children in the United States are currently diagnosed with Attention Deficit/Hyperactivity Disorder. A 6,000% increase in autism diagnosis in recent years has kept pace with the proliferation of wireless grids and gadgets. As reported in the UK Telegraph, 1980 to 2000 saw an increase of nearly 50% in the estimated number of new cases of Malignant Brain/Central Nervous System tumors in the United States. Anyone who starts using wireless devices at any age can expect a 500% risk of developing brain cancer within 10 years – even sooner for children. Using cell and cordless phones is even worse. At current rates, plummeting global sperm counts will hit ‘zero’ by 2048. Almost from the beginning of chemtrails consciousness, Clifford Carnicom began documenting high levels of reactive barium salts falling from chemtrails grids over Santa Fe, New Mexico. Carnicom claimed these salts are making the Earth more conductive. He was right. In the fall of 2002, a long-time landscaper working for the City of Edmonton began noticing that carefully tended flowers and trees were showing signs of severe nutrient deficiencies. City specifications call for Electrical Conductivity readings no higher than “1” in local soils. But Dave Dickie’s soil samples tested for EC 4.6 to 7-times higher than this maximum permissible level. Widespread tree and fish die-offs in California are also being blamed on abnormally high levels of barium and less conductive aluminum. At Lake Shasta, Francis Mangels, a retired soil conservationist and PhD wildlife biologist who worked for the U.S. Forest Service for over 35 years, told Dane Wigington that he blames pH over 10-times the alkalinity of normal soil on huge increases of aluminum oxide. Dane Wigington reports that normal background levels of aluminum oxide in the Mt. Shasta snow is 1/2 unit. (In this case, ug/l). Allowable aluminum in drinking water is 50 units. Government action is required at 1,000 units of detected aluminum. The EPA-tested snow on Mt. Shasta shows aluminum at 61,100 units. Barium clocked in at an elevated 83 units. By July 2001, California state officials still could not explain why barium levels had nearly doubled since 1991. They still can’t say why barium levels in soils and water are rising, when industrial barium pollution has all but vanished. In March 2002, two Lawrence Livermore National Laboratory scientists at Wright Patterson Air Force Base told award-winning reporter Bob Fitrakis that they were involved in two aerial spray programs. One spreads aluminum oxide in the upper atmosphere to reflect incoming sunlight and slow global warming. The other lays down barium stearate aerosols for “over the horizon” military communications, 3-D mapping and radar. Soapy rainwater on highways is a signature of barium salts, one scientist said. They also confirmed that HAARP transmissions from Alaska are being used to bend the jetstream. Clifford Carnicom now states that the amount of Barium in our atmosphere exceeds by eight-times the level deemed safe for humans to breathe. Smaller animals are simply out of luck. And, as Earth’s Sixth Great Extinction keeps rolling, maybe out of time. 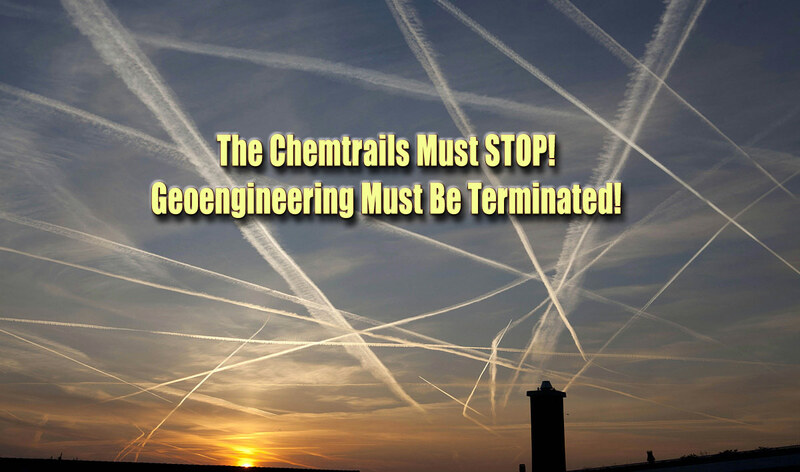 ← Chemtrail Flu — Have You Got It Yet?